Now in its fifth edition, The International Business Excellence Awards are set to be bigger and better than ever. The Awards enables businesses to tell and get recognition for their stories, with categories aimed at providing recognition for companies and individuals implementing outstanding initiatives across the world. The awards finals and ceremony take place on the 29th and 30th April 2019 in Dubai. SHORTLISTED ‘Women in Business Awards 2018’ – Rising Star Category. Women in Business celebrates successful women who have excelled in their specific business or line of work. Referred to as the Working Women’s Oscars, the Venus Awards were formed in 2009 to recognise, reward and celebrate local working women in business. The Venus Awards began in Dorset and has since exploded into other regions across the country. Culminating with an annual National Final that truly represents the inspirational women who balance and juggle their lives relentlessly and unconditionally, who inject their communities with a sense of feminine robustness and solidity only a woman can provide. FINALIST ‘Entrepreneur of the Year 2016’ – Investor Allstars Awards. WINNER ‘Female Entrepreneur of the Year 2015 – Business Services” Stevie Awards, New York. Silver Award. The Stevie® Awards are the world’s premier business awards. They were created in 2002 to honor and generate public recognition of the achievements and positive contributions of organizations and working professionals worldwide. In short order the Stevie has become one of the world’s most coveted prizes. The Stevie Awards for Women in Business recognize the achievements of women executives, entrepreneurs, and the organizations they run. The Global Art Agency has been shortlisted in the top 30 for the Virgin Media Business #VOOM Awards 2015 in the ‘Grow’ category for one of the fastest growing international art platforms. Being shortlisted have helped them to grow even further and enabled further reaching out to all of those that have a love for art. NOMINATED for the Oxfordshire Business Awards – Young Business Person of the Year Award 2015. Anticipated business owners and/or directors who have brought financial benefits to their organisation through their efforts. SHORTLISTED for the Oxfordshire Business Awards – Culture & Tourism of the Year Award 2015. The Oxfordshire Business Awards has been recognising, rewarding and promoting the excellence of Oxfordshire-based companies. The Awards are firmly established as a benchmark for excellence in today’s competitive business environment. SHORTLISTED for the Women in Business Awards 2014 “Rising Star” Category. Women in Business celebrates successful women who have excelled in their specific business, profession, organisation or line of work. The “Rising Star”award is open to Women aged 30 and under who have made their mark as Women in Business. The Winner is a “Woman to Watch”. NOMINATED ‘Sferiq Award for Digital Innovation in Art’ by Investor Allstars. This award recognises a company or individual in the art industry who has used digital technology or the internet to disrupt and innovate within their field. Judging on originality of the ideas, products or services; revenue growth achieved or potential; and the candidate’s success in popularising the innovation, measured for example by growth in web traffic or visitor numbers. The first tradeswomen-focused magazine in the UK, announced and awarded Joelle as the ‘Inspirational Business Woman 2013’. Apart from the business achievements, Joelle stood out because of her passion for art, for the people, and her charity activities said the magazine founder. 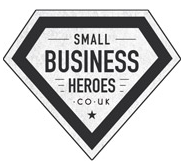 ANNOUNCED as ‘Top Female Entrepreneur’ by Small Business Heroes, UK. “Celebrating the real heroes making British small business great.” The top 15 female entrepreneurs winners were chosen on innovating and succeeding every day. Amongst the other winners are Jimmy Choo founder Tamara Mellon, Elizabeth Jane Associates, and Clare Flynn, CEO of tech startup Essentia Analytics. WINNER “Entrepreneur Award” by MINI Business Entrepreneurship, Netherlands. The achievement was based on starting a new business venture with 7 other selected candidates from the St Lucas Art Academy. Shareholders tripled their investment with the product that they designed and created. Also winning runner-up in a national election broadcasted on TV.